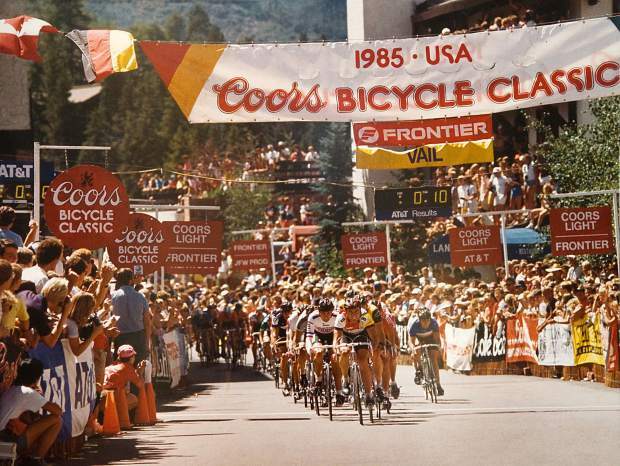 The Coors Classic, shown here in Vail in 1985, was the last major international cycling race to run a circuit race through the Vail Village, which organizers say was a key part of its success. VAIL — The Coors Classic cycling race and its predecessor, the Red Zinger, left an impression on Colorado that will never be forgotten by local cycling fans. Bringing circuit-style racing to the streets of Vail, along with a time trial up Vail Pass that would prove to be an iconic race still being challenged today, the Coors Classic defined Colorado’s role in the sport of cycling. The race eventually outgrew Colorado, and itself, and ended in 1988 after a 13-year history. Since then, several races have tried, but none have found the success of the Coors Classic. After watching the new Colorado Classic bike race unfold last season and attract 15 top teams from around the world, Vail officials have decided its time to double down on that race in an effort channel the Coors Classic and what may have contributed to its success. While the Vail time trial was born out of the Coors Classic, the circuit-style race — where all riders take to the street of Vail simultaneously — seems to have died with it. This year, the Colorado Classic will host the return of a circuit-style race to the streets of Vail, in addition to the classic Vail time trial that has become so legendary. In the Vail circuit races of yesteryear, fans would swarm the streets, overflowing the viewing areas at every possible location. It’s an atmosphere Eagle-Vail resident Stephen Lloyd Wood remembers well, as he participated in the Coors Classic in Vail as a former pro cyclist and national champion. In the circuit style race, Wood remembers an electric atmosphere, and a hellacious course. Chapin said the coverage — which will be broadcast live, in prime time, in Europe — could prove to be a great opportunity for Vail. For fans at the event, fan zones with announcers helping explain the action as the cyclists wiz by will be set up around the village. They will include activities for kids, giveaways, food and beverage stations and more. And that’s just day one, Aug. 16. On Aug. 17 the time trial will provide the classic action up Vail Pass, as riders try to break the record set by Levi Leipheimer in 2011 after going unchallenged since set by Andy Hampsten in 1987. The Whistle Pig Series music festival will also overlap with the event. Race organizers have been working to communicate to the Vail community that this event will require temporary road closures in select neighborhoods during the race window. Emergency ingress/egress will always be allowed but there will be delays with guests or homeowners getting in and out of their hotels, condos or homes in nonemergency situations. Vail Police Dept. Code Enforcement Officer Alan Hernandez will serve as the Colorado Classic Neighborhood Liaison point of contact, and in the coming months will help residents address special health, emergency, or other transportation needs that may occur during the race window. His email address is ahernandez@vailgov.com and his phone number is 970-306-9602. Course maps are available at www. coloradoclassicvail.com.